Laser Port Fun Center Lazerport offers you the newest & tallest 'Roller Coaster Style' go cart track in Tennessee, the largest & most exciting laser tag arena, 18 holes of an all indoor, all black light mini golf course, over 10,000 square feet of extreme action & redemption arcade games & Sweet Sensations - old fashioned ice cream parlor with hand dipped cones, sundaes, shakes, banana splits, funnel cakes and deep fried Oreos and Twinkies. 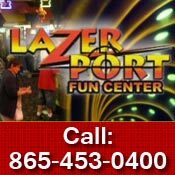 The newest rage in mini golf is all indoor, climate controlled Black Light Golf, and you can only play it here at Lazerport. Relax and unwind in our HUGE 10,000 sq. ft. video action and redemption arcade. Eden Crest Vacation Rentals, Inc.